The Scottish FA says East Kilbride's Scottish Cup fifth-round tie with Celtic will take place at Hamilton's New Douglas Park, despite the club hoping for another venue. The Lowland League club's own K-Park is too small to host the 7 February match, which is live on BBC Scotland. The club had written to the SFA to query the decision to host the match instead at Hamilton's 6,018 venue. But the SFA says rules stated it must choose the closest suitable stadium. The governing body said it had issued its statement to clarify the choice of venue. 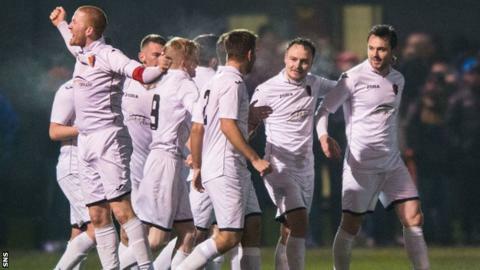 East Kilbride set up a historic clash with the Scottish champions after a 2-0 win over Lothian Thistle Hutchison Vale on Wednesday. Manager Billy Ogilvie told BBC Scotland after the game he was behind the decision to move from the small K-Park ground, which could only hold around 500 fans and had been ruled out on police advise. "Notwithstanding anything which is contained in rule 11, if a club notifies the association that it is unable to play a cup match at its registered ground as detailed in the official return (rule 6 and the articles of association refer) for whatever reason and the board is satisfied of the validity of such reason, the match shall be played at the nearest registered ground of at least equivalent capacity which in the opinion of the board is most suitable for the occasion. "If a replay should be necessary, it will take place at the ground of its opponents." However, the club had previously been asked by the SFA to submit a list of possible venues for the tie. New Douglas Park was bottom of their choices behind their own K-Park, the national stadium, Hampden Park in Glasgow, Celtic Park, Broadwood Stadium in Cumbernauld, Airdrieonians' Excelsior Stadium and Partick Thistle's Firhill Stadium. With East Kilbride believing demand will exceed the capacity of New Douglas Park, which is seven miles from East Kilbride, they were still hoping for a larger venue. In recent years, Albion Rovers were given permission to move Scottish Cup ties with Motherwell and Rangers to Hamilton rather than the closer Airdrie.